Do you want to improve safety, impact compliance, and reduce insurance premiums? SLOGANS: Creating a catchy safety slogan is a smart way to plant an idea about ways to stay safe. Printing that slogan on a variety of promotional items will allow your message to “sink-in”. T-shirts, jackets, vests and caps are all visual clothing items that will promote your safety message every time one is worn. Banners, billboards, posters, and bumper stickers serve as a clean canvas for your slogan along with your company name and logo. Safety messages can also be printed on useful items such as rulers, pencils, sticky notes, calendars, coffee mugs and tote bags. REPLICAS: Giving out miniature items that are replicas of actual safety items can sometimes be an effective way to send a subliminal message. Key chains or carabiners can be accessorized with mini-size hard hats, fire extinguishers, safety goggles or life preservers. Small flashlights, mace sprays, hand sanitizers and boxed band-aids all promote different aspects of safety while serving a useful purpose. BLITZ: If you need large quantities of your promotional items, but have a minimal budget, there are still ways to send a safety message. 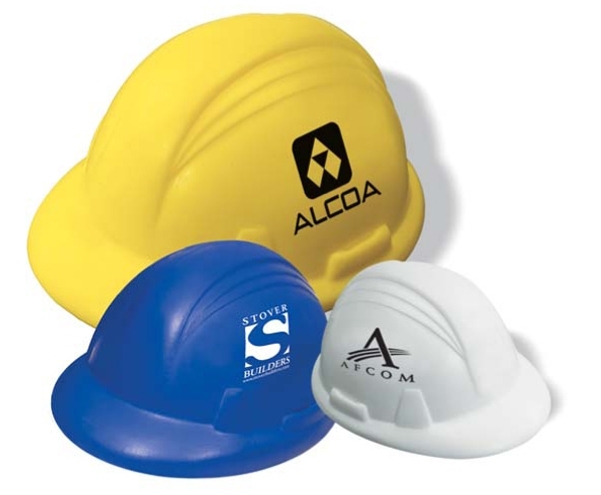 We can offer a variety of candies with a safety theme such as wrapped mints with a printed message on their packaging or chocolate hard hats with a Think Safety message on the visor. Chewing gum, chocolate coins in gold foil, lollipops and individually wrapped cookies are all lower-budget items that can be mass-produced. Sweet! Click here for a blog article we wrote about keeping an eye on safety incentive programs and some great safety products that are functional, and look cool!